After 50 grueling days battling Hamas terrorists, El Al reunites soldiers with parents in the first meeting in years for many. 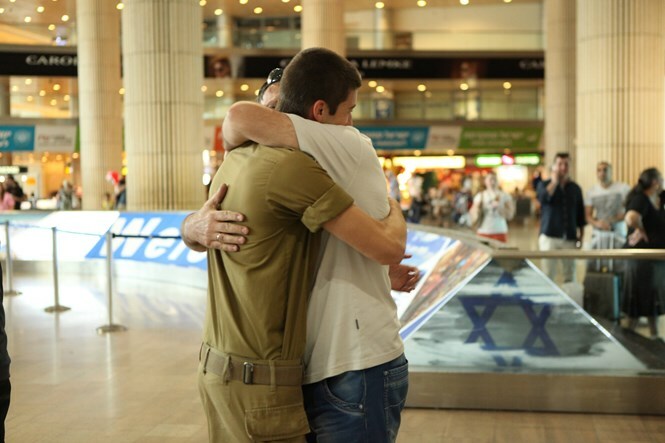 Arutz Sheva was on the scene at Ben Gurion International Airport on Thursday, as the first batch of 125 parents of IDF lone soldiers who fought in Operation Protective Edge while living alone in Israel arrived as part of a special reunion project. 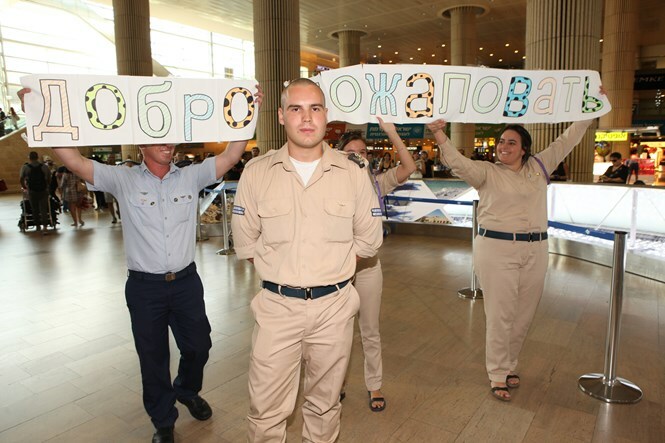 The heartwarming initiative, arranged by El Al Airlines, the Israel Hotel Association (IHA), the Association for the Wellbeing of Israel's Soldiers (AWIS) and the IDF's Manpower Directorate, began with a flight from Moscow on Thursday. Einat Yanai, El Al's Chief Marketing Officer, told Arutz Sheva at the airport "we had a really difficult summer this year. El Al, as the national airlines of Israel, decided to initiate emotional reunions of the families of lone soldiers who came to Israel by themselves to contribute to the country." "We are witnesses to the first flight that is landing here from Moscow. ...Later today and tomorrow additional flights will arrive from the United States, Canada and European countries," noted Yanai, outlining a project of 21 total flights that will have 77 soldiers reunite with their parents - in some cases for the first time in many years. Yanai added "on Sunday there will be a moving meeting of all the families for a toast in honor of Rosh Hashana (the Jewish New Year). It's a great opportunity to say happy new year to the whole state of Israel." The families of the soldiers will be put up at 26 IHA hotels for five days of free accommodation, in the first event of this scope ever to be conducted. One of the mothers a lone soldier in the project, Dovrat Ifis, said "the timing is just perfect and our soldiers truly deserve it, the time has come to hug them and spend some quality family time with them. And on top of this, the best part is that we get to celebrate Rosh Hashanah together." El Al CEO David Maimon assessed the operation, saying it "has proved what our country is capable of as a society, and as individuals. It showed us the solidarity, the courage and the unity that the people of Israelis capable of despite the diverse layers of its society." "We initiated this project in order to show our appreciation to the lone soldiers, who bravely decided to leave their home country and protect Israel. El Al airlines took part in this project by providing the parents of our lone soldiers with free flights, and is wishing them a peaceful and quiet year," concluded Maimon. During trying times of war "we can see the beautiful side of the people of Israel: the sudden mobilization of its people in order to help the society," remarked Eli Gonen, IHA president. "We are opening our hotels and our hearts to the lone soldiers and their families, providing them with a feeling of home and comfort during the holidays."